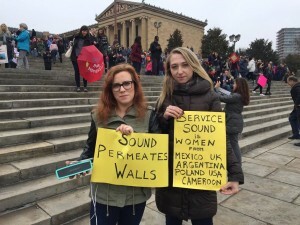 Service Sound is an experimental project gathering sounds of protest. Listening (to) Cyborgs founders sent out an international call for sonic submissions in early January 2017. Individual submissions arrived with particular affects, histories, and geographies. 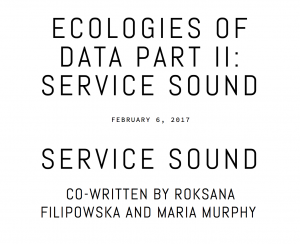 Relinquishing their own voices, Maria and Roksana broadcast the gathered sounds during marches and rallies, contributing recordings of those who could not be present.